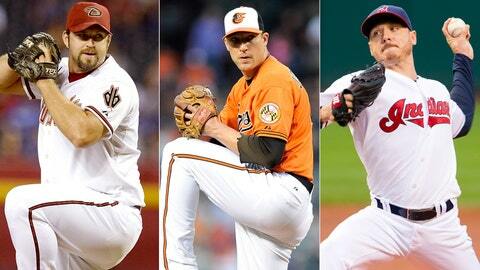 Pitchers Heath Bell, Jim Johnson, and Scott Kazmir all changed teams Tuesday. So much news, so much to digest. The flurry of trade and free-agent activity the past two days raised a number of questions. Here are some answers, non-Jacoby Ellsbury division. What got into the Athletics? In a span of just more than 24 hours, the Athletics signed free-agent left-hander Scott Kazmir and made separate trades for closer Jim Johnson, center fielder Craig Gentry and reliever Luke Gregerson. A’s GM Billy Beane makes no secret that he despises the hothouse environment of the winter meetings. Well, now he can stay home. As Beane noted Tuesday, the A’s don’t operate with five-year plans; they need to seize the moment whenever possible. Here they are, coming off two straight playoff appearances, operating with financial flexibility, watching their division rivals navigate various states of transition. Kazmir is a risk at two years, $22 million; his 158 innings last season represented his highest total since 2007. Johnson, who projects to earn more than $10 million in arbitration, is rather high-priced for a low-revenue team. Hey, nothing is ever perfect. But the Athletics’ bullpen, with both Johnson and Gregerson at the back end, now might be the deepest in baseball. The Athletics actually will get something of a rebate on the Johnson deal, too — they can keep left-hander Sean Doolittle and righty Ryan Cook in setup roles, holding down their future salaries in arbitration. Heck, if they like Johnson, they could even make him a qualifying offer in the range of $14 million at the end of the season and try to retain him for another year. While such a price would be awfully high, the qualifying offer would crush Johnson’s market as a free agent, perhaps leading to a favorable multiyear deal. If Johnson produced a third straight 50-save season, the Athletics almost certainly could trade him, too. Ah, but that’s a concern for later. The A’s are trying to win now. Gentry actually was one of the team’s primary targets; right-handed hitting center fielders are difficult to find, and the A’s also investigated a deal for the Diamondbacks’ A.J. Pollock. Part of this is about preserving Coco Crisp; manager Bob Melvin now can rest his regular center fielder on occasion and use him as a DH. Gentry, who is under club control for three more seasons, also protects the club against an injury to Crisp and against his potential departure as a free agent at the end of the season. Righty Josh Lindblom, the other player acquired from the Rangers, gives the team additional rotation depth — and oh, yes, the Athletics still can explore trades of left-hander Brett Anderson, in a market starved for starting pitching. Beane can kick up his feet next week in Orlando, hang out at Disney all day if he wants. His business is essentially complete. Why are the Orioles the only team dumping salary? 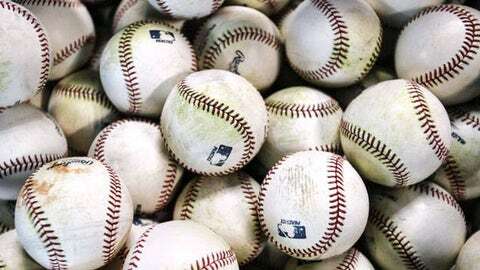 The industry is flush with cash, and the Athletics are not the only low-payroll team showing surprising aggressiveness. The Marlins signed free-agent catcher Jarrod Saltalamacchia for $21 million. The Royals could spend more than twice that on free agent Carlos Beltran. The Astros landed Dexter Fowler and earlier bid on free-agent starting pitchers such as Phil Hughes and right-hander Josh Johnson. Want more? The Padres’ payroll will be in the mid-$80 million range, according to one rival club’s estimate. The Twins spent a combined $73 million on Hughes and Ricky Nolasco. And yet, the Orioles dumped Johnson because they did not want to pay him $10 million-plus in arbitration. GM Dan Duquette told reporters that the trade was “really about the allocation of resources.” Fair enough; the wisdom of paying Johnson such a large sum remains to be seen. But the Orioles, while facing payroll issues that I outlined in an earlier column, cannot rest. They need to prove that the trade of Johnson was not in vain. The team plans to find a new closer — free agents John Axford and Edward Mujica are among those on the O’s wish list, sources say. A big bat also is a possibility, but Beltran is a long shot, and given the depleted of the state of the Orioles’ farm system, the club is reluctant to sacrifice a high draft pick for Nelson Cruz or Curtis Granderson. Why didn’t get Tigers get more for Doug Fister? This one still has rival executives scratching their heads. Fister is one of the top 10 or 15 starting pitchers in the game, and will be quite affordable at approximately $18 million to $19 million combined in his final two years of arbitration. Yet, the Tigers parted with him for a utility infielder, Steve Lombardozzi, a promising 20-year-old left-handed reliever, Ian Krol, and a solid left-handed prospect, Robbie Ray, who could develop into a No. 3 starter. As my colleague Jon Paul Morosi explained, the Tigers were setting themselves up for other moves, starting with the signing of free-agent closer Joe Nathan to a two-year deal in the $20 million range. A free-agent left fielder could be next, but that doesn’t alter the essential question: Would another team have beaten the Nationals’ offer? As J.P. wrote, Dombrowski merits the benefit of the doubt. Why didn’t the Rockies get more for Dexter Fowler? Fowler, 27, isn’t an All-Star, and his career OPS-plus — OPS adjusted to league and park — is barely above the league average. His home-road splits hurt his value, advanced metrics aren’t kind to his defense in center and he’s also getting expensive at $7.35 million next season, with one more year of arbitration after that. OK, but a center fielder with two more years of club control should yield something of quality, and the question is whether Lyles can be that guy. The Rockies feel he was rushed to the majors and still has upside. They received trade inquiries on him from other clubs within 30 minutes after the trade was completed, according to a source. Why did the Rays want Heath Bell? Bell was unpopular with both teammates and fans in Arizona, yet the Rays obtained him in the three-team trade in which they also landed catcher Ryan Hanigan from the Reds. As Fernando Rodney and others can attest, the Rays are practically a halfway house for wayward relievers. And, truth be told, Bell’s performance last season was encouraging. His rate of 9.87 strikeouts per nine innings was his best since 2010. His rate of 2.19 walks per nine was a career-low. And his rate of 1.64 homers per nine — while a career high — probably can be dismissed as a fluke. On the flip side, Bell will be playing for his fourth team in four years, and pitching in the American League for the first time. Whether he closes or not, he will be under pressure to produce with the Rays paying $5.5 million of his remaining $9 million salary. If Bell fails to succeed under Rays manager Joe Maddon and pitching coach Jim Hickey, then his career trajectory could spiral downward quickly. Why did the Diamondbacks part with promising Double-A left-hander David Holmberg for Single-A right-hander Justin Choate and a player to be named? One, because GM Kevin Towers says the player to be named is the more important part of the return. And two, to save the $5.5 million remaining on Bell’s contract, which they will now reallocate to one or more other players. Towers said in a conference call with reporters that Bell “still had a lot left in the tank,” but that his curveball wasn’t as good as it had been in San Diego. In any case, the trade is too early to judge from Arizona’s perspective — we need to find out who the player to be named is, and we need to see what they do with the money they saved. Why did Phil Hughes accept a three-year, $24 million free-agent contract from the Twins when he likely could have negotiated a higher salary on a one-year deal? Some rival executives say that Hughes could have gotten $9 million to $10 million for one year, though a source with knowledge of the negotiations says that he did not receive any offers at that level. If Hughes had taken one year and put together a big season, he likely would have received a qualifying offer next offseason and then could have made about the same amount over two years as he will receive over three. So, one exec asked, what is the problem? Does Hughes not believe himself? Is he concerned about getting hurt? Fair questions, but keep in mind that a one-year deal is riskier for a pitcher than a position player, given the possibility of injury. And remember: Hughes, 27, will be only 30 the next time he hits the open market, still relatively young for a free agent. So, he gained security with his new contract while still preserving his chance to earn even more on his next deal.